Kiwi recipes | 87 kiwi recipes. Kiwi is a fleshy, green fruit with tiny black edible seeds. It has a unique sweet and sour flavor. You can simply cut the fruit into half and scoop it with a spoon and it. The juicy fruit can also be tossed with other fruits and vegetables to make attractive salads and fruit bowl. Kiwi fruit is rich in Vitamin C, potassium, magnesium and anti-oxidants. Kick start your morning with this rich in protein, Coconut Chia Pudding Super Bowl. It’s delicious when blended with coconut milk, subza and chia seeds. You can top with kiwis, mosambi and grapes. Mango Apple and Kiwi Drink is a delectable, refreshing drink that you serve at a party. You can even infuse water with fresh kiwi and sip on it throughout the day to flux toxins out of your body. Kiwi Infused Coconut Water is perfect on a hot summers day as a healthy replacement to plain water. Kiwi is largely used in the preparation of fruit-based cakes, pastries, mousses, etc., and as a topping on desserts. A simple Kiwi Pastry layered with whipped cream and kiwi cubes is sure to delight your palate. Cheesecake fans can even make this no-bake Kiwi Cheesecake. Sandesh, a traditional Bengali mithai is made using sweetened chenna. How about giving it a party look? Try this Layered Fruit Sandesh which is not only appealing but also, appetizing and easy to make. For chocolate lovers, this sumptuous Layered Fruit, White Chocolate and Coconut Biscuit Dessert make an interesting, filling dessert. 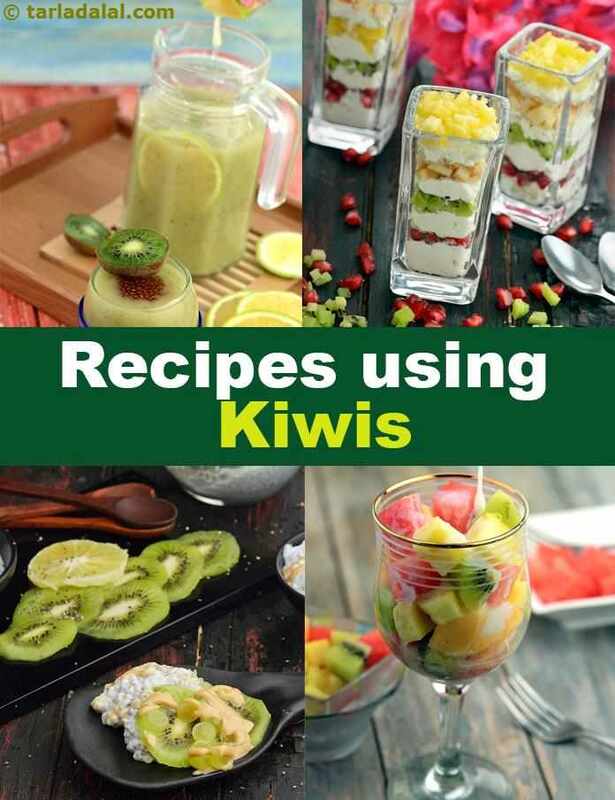 Try your hands on recipes like Fruit Tart Chaat, Whole Wheat Fresh Fruits Pie, Fruit and Jelly Sundae from our collection of 87 kiwi recipes and find new ways to use the kiwi fruit. The kiwi smoothie is sure to give your taste buds a wake-up call, as it imbibes the true flavours of the tangy kiwi fruit. This drink is to be consumed immediately as it might turn bitter in the course of time. Rainbow salad, simple to make and easy to digest! this salad is bountiful of nutrients like vitamin a and c, which act as antioxidants. Ageing takes toll on our skin via wrinkles and blemishes, heres a healthy salad to keep your skin healthy and glowing. A quick-fix pie-crust made of digestive biscuits with a seductive dark chocolate cream filling, decorated even more temptingly with fresh fruits, the creamy chocolate pie is an irresistible dessert. Yummy Kiwi drink best served chilled in summers! The khus sharbat gives indian tang and kiwi adds to the international flavour while mint gives freshness. Kiwi smoothie, full of vitamin c and good for heart patients and diabetic patients, it can be served at any time during the year. This healthy smoothie is made from green and golden kiwifruit with the combination of vanilla ice cream and banana. Pizza, hmmm mouth is watering? this is desert pizza with green and gold kiwifruits with cream cheese is delicious and irresistible.